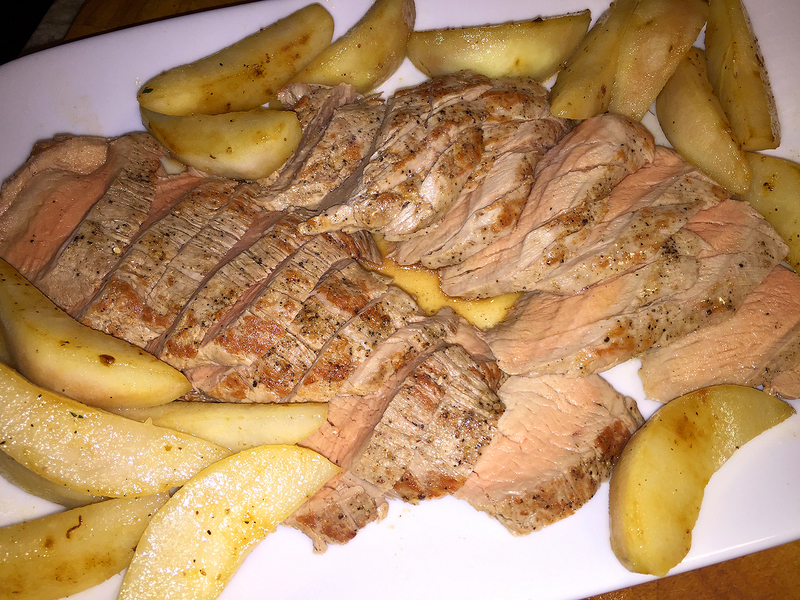 You need a break from all of the fancy, fussy, time-consuming meals you’re making during the holidays, so try this Pork Tenderloin with Pears and Cider—with flavors that are off the charts! A creamy sauce flavored with shallots, cider, and mustard brings together pork and fresh pears in this fabulous cool-weather dish. And while sautéed green beans and wild rice pilaf would make lovely accompaniments, we made baked sweet potatoes with a shallot butter, thyme and a drizzle of maple syrup. Perfecto! And easy enough for a well-rounded weeknight meal. What’s not to like about it? 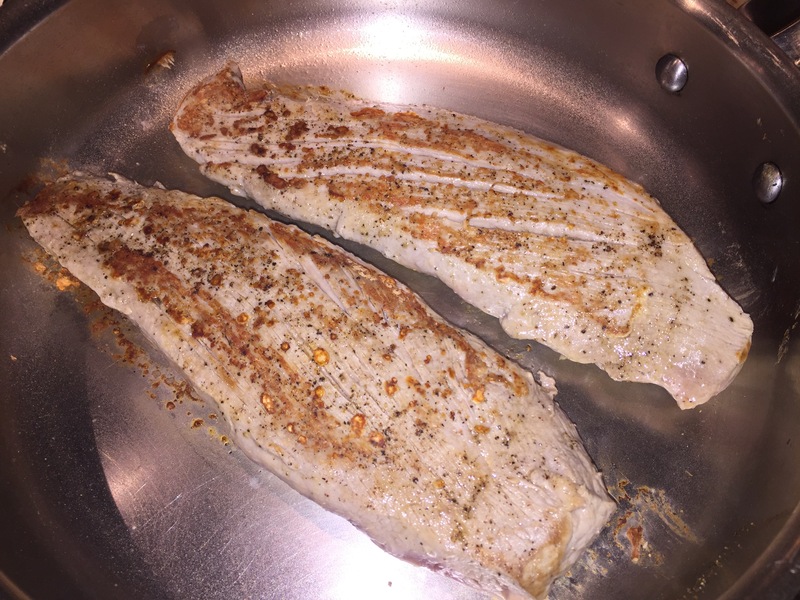 Searing the pork tenderloins to get a nice browning going. 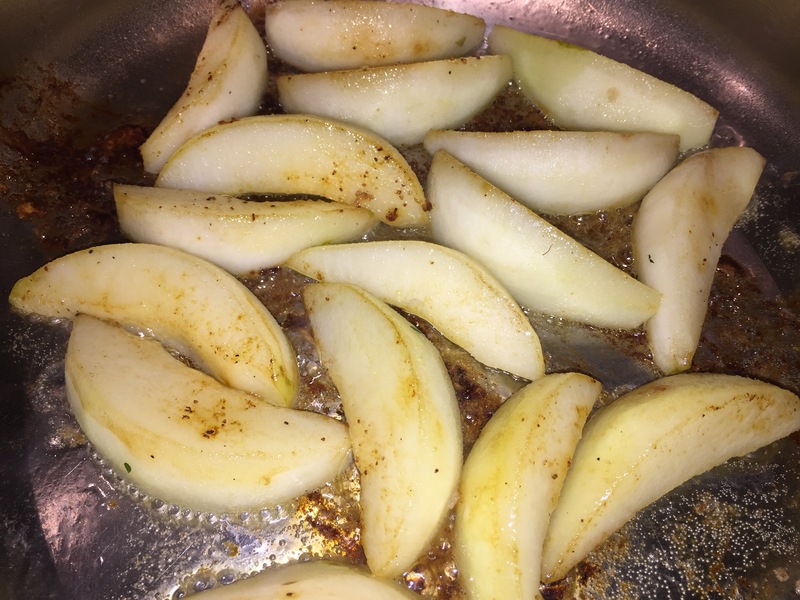 While the pork is “resting,” cook the pear slices until lightly browned. After removing the pears from the pan, make the shallot sauce. Sliced tenderloin and pears arranged on a platter. The finished platter with the cider sauce topping the meat. Position a rack in the center of the oven and heat the oven to 500°F. Pat the pork dry, rub it with the oil, and season generously with salt and pepper. Heat a heavy-duty 12 inch skillet over medium-high heat until very hot, and then sear the pork on all sides until golden brown, about 6 minutes total. Transfer to a small rimmed baking sheet and roast until an instant-read thermometer inserted into the thickest part registers 140°F, 10 to 15 minutes. Transfer the pork to a cutting board, tent with foil, and let rest for 5 minutes. Meanwhile, melt 1 Tbs. of the butter in the skillet over medium-high heat. Add the pears in a single layer and cook, flipping once, until just tender and lightly browned, about 3 minutes per side. Transfer to a plate and keep warm. Add the remaining 1 Tbs. butter and the shallots to the skillet and cook, stirring, over medium heat until the shallots are just beginning to turn golden, 2 to 3 minutes. Add the vinegar and stir, scraping up any brown bits. Add the cider and cook until slightly reduced, 2 to 3 minutes. Whisk in the heavy cream, mustard, and thyme and cook until slightly thickened, about 3 minutes. Season to taste with salt and pepper. Slice the pork and serve with the sauce and pears. 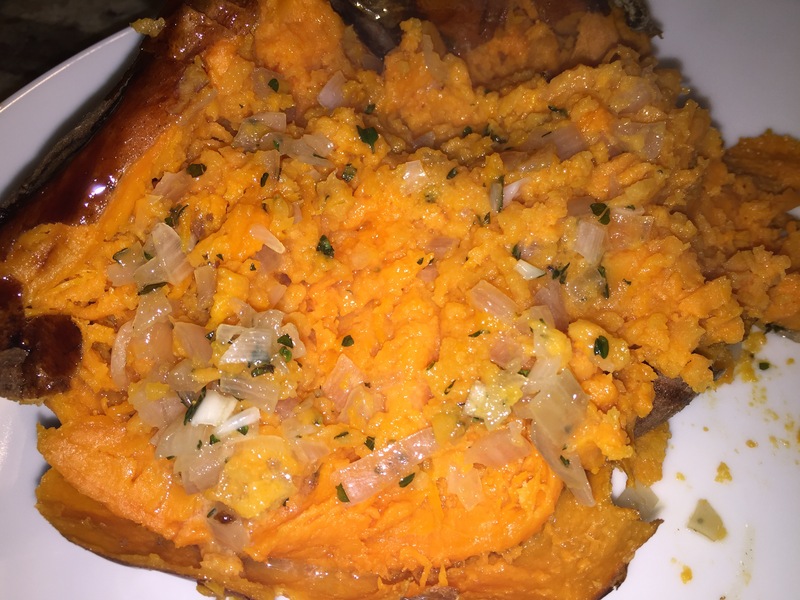 Close-up of the baked sweet potato with shallot butter sauce. 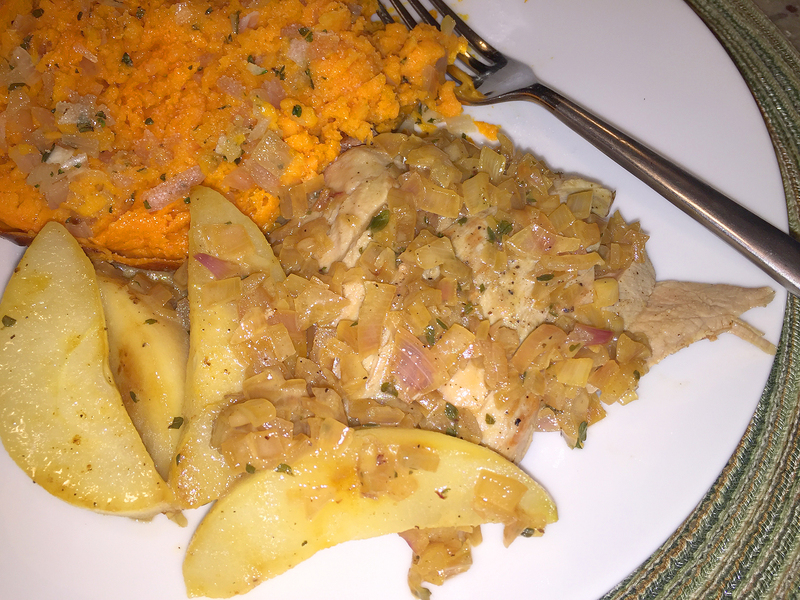 Scrub whole sweet potatoes and prick them in several places with a fork. You can microwave or bake in a 400 degree oven until soft enough to pierce easily with a fork. 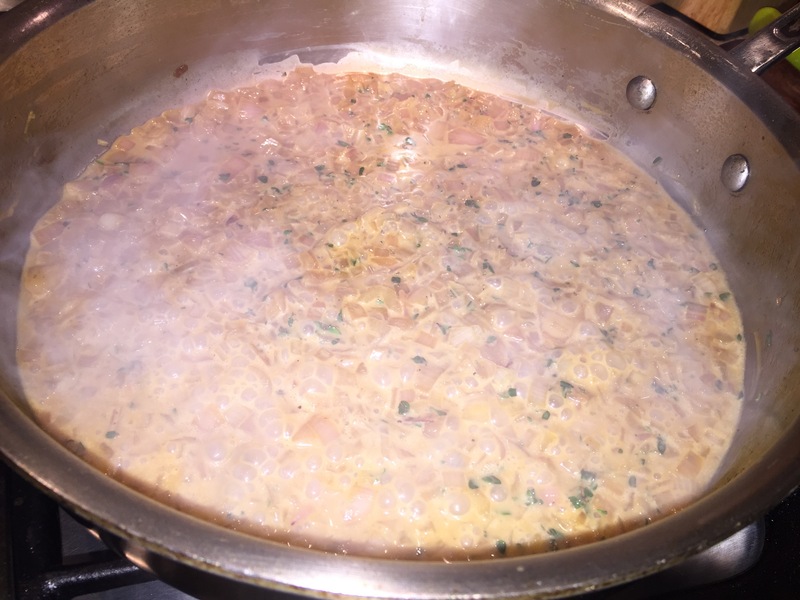 Meanwhile, brown some finely chopped shallots in about a tablespoon of butter in a small skillet. In a small bowl, combine the shallots with more (up to you) room temperature butter, a little minced thyme, a drizzle of maple syrup, and finely chopped pecans (optional). 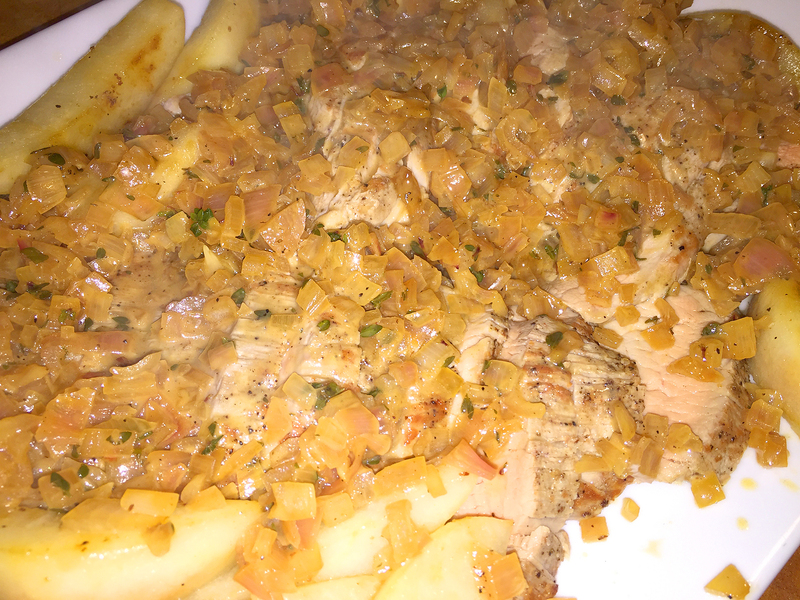 Add a pinch of salt and mash everything together with a fork until well blended.